Survey Says | Wott's Up With That? “Rasmussen poll: 69% Say It’s Likely Scientists Have Falsified Global Warming Research” (2011-08-03). 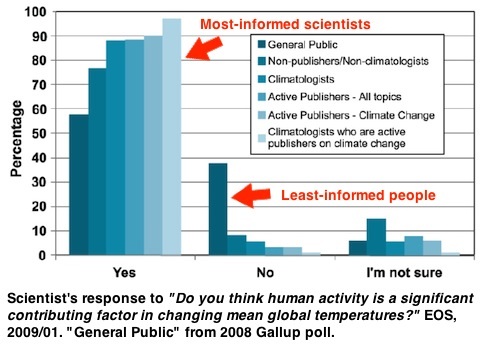 Anthony Watts breathlessly reports that 69% of Americans think that climate scientists are liars. Anthony loves science by opinion poll, especially when the pollsters have a reliable Republican inclination. Actually, the trumpeted answer is to this question: “…how likely is it that some scientists have falsified research data?” Of course, even Rasmussen Reports described their own results falsely so how would an inquiring mind like Anthony do any better than what he was spoon-fed? How closely have you followed recent news stories about global warming? Does the media make global warming appear to be worse than it really is, better than it really is or do they present an accurate picture? Nice try, Anthony. A quick inspection of the morass that passes for insightful comments on Anthony’s blog shows that no-one noticed the “simplification” of the results, so I guess he’s not quite as dumb as his readers. “Lawrence Solomon on consensus statistics“. Lawrence Solomon, a famously stubborn Canadian conservative pundit, tries to reinvent the science of conducting surveys so he can claim the statement that “97% of the world’s climate scientists accept the consensus” is an embarrassing lie. Read his Comment at the Financial Post. Doran and Zimmerman (2009) surveyed 10,257 “earth scientists” but only reported the opinions of 77 of them! What a cheat! Hmmm. That would be the most expert group: actively publishing climatologists. Anderegg et. al. (2010) also found 97% support based on publicly signed declarations, while a few years back Oreskes (2004) found no relevant papers rejecting the consensus, with 25% not taking a position. Read impartial coverage of Doran and Zimmerman’s findings on ScienceDaily, and perhaps ponder for a moment how any voluntary survey is conducted. Solomon’s research seems to come straight out of a denialist think tank “original paper” by the Science and Public Policy Institute back in December, Harold Ambler’s Climate “Consensus” Opiate, The 97% Solution. These are the same guys who proudly published Anthony Watts’ own lame high-school project, the results of his surfacestations.org survey. Solomon’s argument was recycled a few days later by his Australian doppleganger, Andrew Bolt. Deltoid link does a good job of dismantling the arguments in both newspapers. Coincidental? Solomon’s opinion piece turned up a day after a press release from the fake “National Association of Scholars” announced Fred Singer’s similar claim that an “Estimated 40 Percent of Scientists Doubt Manmade Global Warming“. So what is scientific opinion on climate change? Well you could try Wikipedia (Scientific opinion on climate change and Climate change consensus) or Skeptical Science. Shredding the “climate consensus” myth: More Than 1000 International Scientists Dissent Over Man-Made Global Warming Claims – Challenge UN IPCC & Gore. Anthony Watts’ friends at Climate Depot have a growing list of “eminent scientists” whose keen perception of climate science leads to such conclusive analyses as “the whole thing is a fraud“! There are now a thousand senile Republican curmudgeons bravely demanding to be heard! Everyone else is apparently a co-opted, indoctrinated, coward. So, Anthony, is a thousand an increase from 400 or is it a decrease from 31,000? There are so many faked-up lists of denialist supporters that it’d hard to keep track of them all. “Climatologists consensus on global warming: poll sample size 79“. A blog called “The Hockey Schtick” has discovered a nearly two year-old report, Examining the Scientific Consensus on Climate Change in the American Geophysical Union’s weekly newspaper EOS. Apparently only 76 out of 79 climatologists (96.2%) surveyed thought that global warming is ‘significantly’ due to human activity! The total number of responding scientists was 3146, of which a mere 90% agreed with the survey question. Reading the self-descriptions of commenters at Watts Up With That may lead you to the conclusion that there are hundreds of ‘skeptical’ but anonymous climatology PhD’s out there. The reality is that the sample size of “active climatologists” in any poll will be small. Also, only 58% of the general public though the same thing. The denialists are almost winning! Global Warming is nearly over! The less people educated people are about climate, the more inclined they are to discount it. That's Anthony Watts' sweet spot. Survey results from EOS, Jan. 2009. “A cool 50 million“. Anthony Watts is very pleased with his web statistics. He wants you to think that “hits” mean something. In fact “hits” are a widely discredited, much like everything else Anthony shouts as proof against Global Warming. Hint: each time a web page loads every image, as well as many other items, counts as a hit. Anthony’s pages typically have at least 30 graphics each. We touched on this a few days ago when denialist/internet genius Mike Lorrey tried to explain that feverish clicking meant the world was beating a path to Anthony’s door. Physicist Joe Romm, whom Anthony considers a deadly rival with his Climate Progress website, schools Anthony on the subject (again) better than I can, so just drop over for an enlightening chuckle. Anthony claims he’s “beating” Joe, but somehow Joe has 50 million hits in 2010 alone. As usual when Anthony is trying to boast he likes to interrupt his character assassination and general polemics to make grand statements like “I’m really growing tired of the vociferous and voluminous name calling and people bashing, on both sides. It’s palpable.” Oh. My. God. You know what’s “palpable” Anthony? Your hypocrisy. You both encourage and participate in the ugliness. “AMS/NWA sponsored survey of TV weathercasters: 63% Believe Global Warming is Mostly Natural“. 100% of “Tea Party” supporters don’t believe in Global Warming either. That must mean there isn’t any. Anthony Watts loves irrelevant surveys, like this one conducted by George Mason University on behalf of the American Meteorological Society and the National Weather Association. I note with amusement that only 53% of TV weathercasters trust other TV weathercasters! The New York Times has an unfortunately credulous take on the survey, but Joe Romm at Climate Progress cuts to the heart of the matter. Anthony, TV weathercasters are not scientists, let alone climatologists. You should know, just ponder your own background. The survey concludes that TV weathercasters are seen as informal “science educators” (regardless of qualification) and that “79% of the respondents would like to be considered the “go to” person in a TV newsroom on a variety of science topics.” Again, regardless of relevant qualification. So what’s the real takeaway from this survey? TV weathercasters are generally scientifically unqualified, but are eager to share their ignorance. I don’t know if I’d be announcing that too loudly.